The Rosen Scholar is a fellowship created to honor the memory of Louis Rosen, his accomplishments, hard work, and affection for the broad range of science performed at LANSCE. Louis Rosen's outstanding leadership and scientific career at LANL covered six- and-a-half decades and included conception of the Los Alamos Meson Physics Facility (LAMPF), during 1960, that culminated with its commissioning in 1972. Today LANSCE performs research in materials science using neutron scattering at the Manuel Lujan Neutron Scattering Center, dynamic materials at the Proton Radiography Facility, and applied and basic research in nuclear physics at the ultra- cold neutron facility, WNR, and the Lujan Center. 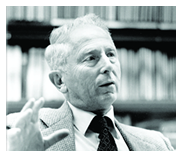 The Rosen Scholar is reserved for individuals recognized as scientific leaders in a field of research currently performed at LANSCE and who exemplify the innovative and visionary qualities of Louis Rosen. Both experimental and theoretical scientists are encouraged to apply. The Rosen Scholar is expected to be resident at LANSCE and bring his/her scientific expertise to LANSCE as well as the broader Los Alamos scientific community. The position will support the Rosen Scholar at their current salary including relocation expenses for up to one year.